75 minutes of Donald Fagen talks to Warren Bernhardt about composition, voicing, and runs through some Steely Dan and solo stuff. The explanation of the voicing on Peg is worth your time alone. So much in here – and nice filming of _hands_ for once. That’s me, sitting on the ground in the Cosmodrome in Old Russia. The Cosmodrome is an environment from Bungie’s Destiny. I played it during its public beta last week. One of my favourite things in Destiny is its sit down button. The directional pad is used to ’emote’ in a very limited manner in the game. Two of the emotes are very specifically non-verbal forms of communication, useful for players without headsets: you can wave, either into space or at another player, and you can point. I used these quite a lot with both strangers and friends. One of them is daft self expression: the dance button. This is probably the most popular emote; it feels like many players hadn’t played enough MMOs to have had their fill of daft emotes, and so the idea that one can just dance – not just on your own, but with other people – for no reason other than you’d like to is a new and exciting one. It’s actually how dancing ought to be, when you think about it: a fun thing you can do whenever. There was lots of dancing in Destiny. My absolute favourite emote, though, is sitting. And the main reason for that is the sitting down animation. If pushed, I’ll take the female sitting down animation over the male one for one simple reason. Male characters look more like they’re sitting down to kill time, staring either into their hands, or just above them – it’s hard to tell, and it feels critical. It’s how you might sit by a campfire with friends (if you were looking up) or in a dreary queue for a gig or festival (if you’re looking down). The female characters, though, always look like they’re sitting down to look at something. Which is so apt, for Destiny; the skyboxes and vistas the game presents (when it’s not throwing Dregs and Thralls at you) are beautiful. They’re the sort of things you want to take in with friends; pass time watching the day-night cycle. 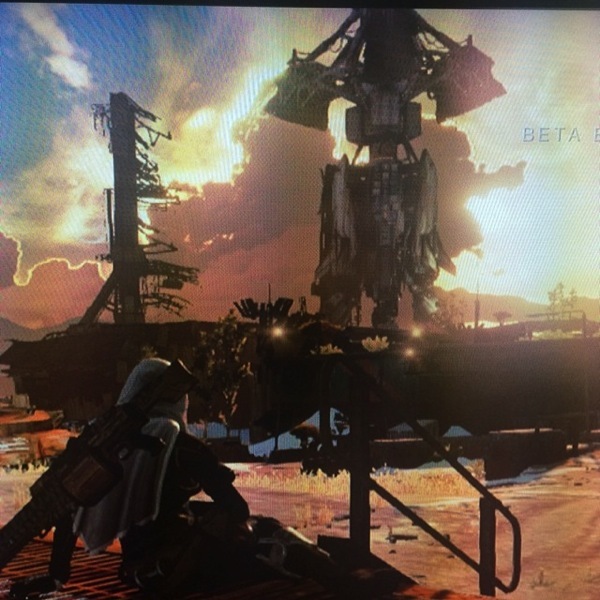 I love seeing the massed Guardians in the Tower, all sitting at the edge, watching the clouds roll across the sky. What are they doing? What are they talking about in their Fireteams and Private Parties? The idea that sitting is active – that you might sit to do something with your friends, not to indicate an absence of activity – is a lovely thing to be reminded of. It applies tenfold – no, far more, hundredfold at the very least – to the world outside Destiny. I like that my Guardian reminds me of this every time she sits down. But sitting down also had a functional purpose for me: I’d also sit down in Destiny to indicate I’d wandered away from my games console. There’s no pause button in Destiny – it’s always online – but there are enough quiet areas of a map, especially when you’ve cleared out enemies, that you can just sit down and wander away with few ill results. You might even discover how lenient Destiny’s respawning is (as long as you’re not in a Darkness zone). I was playing with some New York friends at the weekend. They were playing pass-the-pad, and I was on my own. They didn’t have a headset, so we IM’d on our phones to explain the things we couldn’t show with a point or a wave. “Could we pause 30 secs while I put the kettle on,” asks my friend. And why not? There’s nothing around threatening. I say that I’ll go and do the same and wave when I’m back. I push down on the d-pad, and I/my Guardian sit(s) down for a break. I wander into the kitchen to make tea and toast. I’d been meaning to write about how much I liked the sitting in Destiny – the “looking into space” aspect of it. And today, somebody else reminded me the other reason that its sitting felt important to me. Jenn Frank is right when she describes how infuriating her husband’s behaviour is when confronted with a game that has no pause button. She’s entirely right to be annoyed. Reading her post, I recognised a kind of bad behaviour it’s easy to slip into – and remembered what I used to do about it. I know that whilst online games of all shapes and sizes encourage you to keep playing – and have no pause button – they also have a reasonable number of safeguards against it in their systems. Or, at least, they should. World of Warcraft has towns, safe from attack; PVE servers, where other players aren’t a threat. Lots of ways to park your character (although not, say, in dungeons or raids, just as all the multiplayer shooters I played lock you in for the scope of a single game). I had no idea how anybody played on a PVP server – it seemed to require permanent, always-on concentration. Back in the months I played WoW, whenever I wandered away or alt-tabbed for a bit, I’d make sure my character sat down, showing the world they were absent. A little bit of playacting – something better than afk. I’m glad it still works in 2014. You can do it almost anywhere. Take a step back. Find a quiet corner. Down on the d-pad. Your Guardian will sing a campfire song, and you can sign that rental agreement, hold the step-ladder to the loft, and talk to your relatives on the phone. This is good – although it's _another_ reminder that my notebooks are not as legible as they once were. "Arrive early. Arrive early? Sounds simple. It is — let me show you. Arrive so early that a friend will text you, What R U sixty years old? No, you’re not sixty, you’re much older, because the wisdom of the early arrival seems to have eluded even most sixty-year-old travelers." "'Second Moon' tracks the cyclical journey of a small fragment of the moon as it circles the Earth, via air freight courier, on a man made commercial orbit." So good. "It is pleasant to work on something that people draw benefit from. It is especially pleasant to work on something lasting. And I enjoy the looking-glass aspect of our industry, where running a mildly profitable small business makes me a crazy maverick not afraid to break all the rules." Pinboard is – obviously – one of my favourite products. And yes, I love the tone of Maciej's "brand" that he's built. But I also love how straightforward he is about describing the business and process of making something that Just Works and doesn't have ideas beyond being solid and dependable. How To Tell If You Are In A Jorge Luis Borges Story? "You are in a library that may not exist. You are having a terrible time." And so forth. Chunky has replaced Comicflow as CBR/CBZ reader of choice. It's really nicely made.